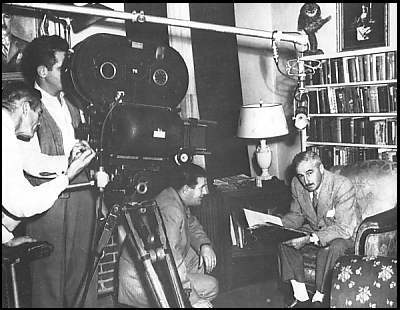 In 1952, Faulkner agreed to participate in a short documentary financed by the Ford Foundation. In the seventeen-minute film, Faulkner is shown visiting the law office of his old mentor, Phil Stone, the store of his friend and pharmacist, Mac Reed, and speaking to townspeople on the square near the courthouse. The script called for the players to pretend it was shortly after Faulkner had been awarded the Nobel Prize in December 1950. During this scene in the library at Rowan Oak, Faulkner is receiving a visit from Phil Mullen (not pictured), editor of the Oxford Eagle, who is trying to cajole Faulkner into granting him an interview, since people will want to know more about the winner of a Nobel Prize. In the film script, Faulkner agrees, but adds  while still on camera  "But no pictures." The documentary was broadcast on CBS-TV's Omnibus program. This page has been accessed 2213 times. About this page counter. Last Revised on Monday, November 9, 2015, at 04:35:07 PM CST.